January 2012 Global Temperatur​e Report From The University Of Alabama at Huntsville | Climate Science: Roger Pielke Sr. 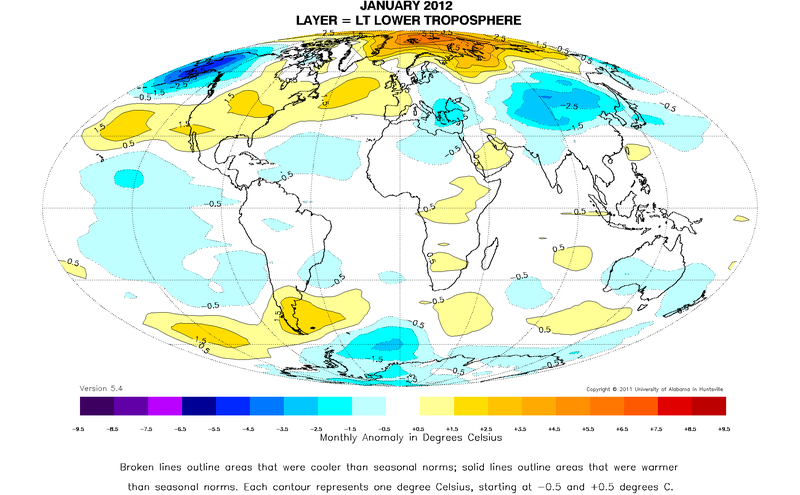 Thanks to Phillip Gentry, the University of Alabama at Huntsville February 2 2012 report on the global lower tropospheric temperatures is reported below. Global composite temp. : -0.09 C (about 0.16 degrees Fahrenheit) below 30-year average for January. Northern Hemisphere: -0.06 C (about 0.11 degrees Fahrenheit) below 30-year average for January. Southern Hemisphere: -0.13 C (about 0.23 degrees Fahrenheit) below 30-year average for January. Tropics: -0.13 C (about 0.23 degrees Fahrenheit) below 30-year average for January.